My daughter Ava's colour is purple, specifically the colour of lilacs. 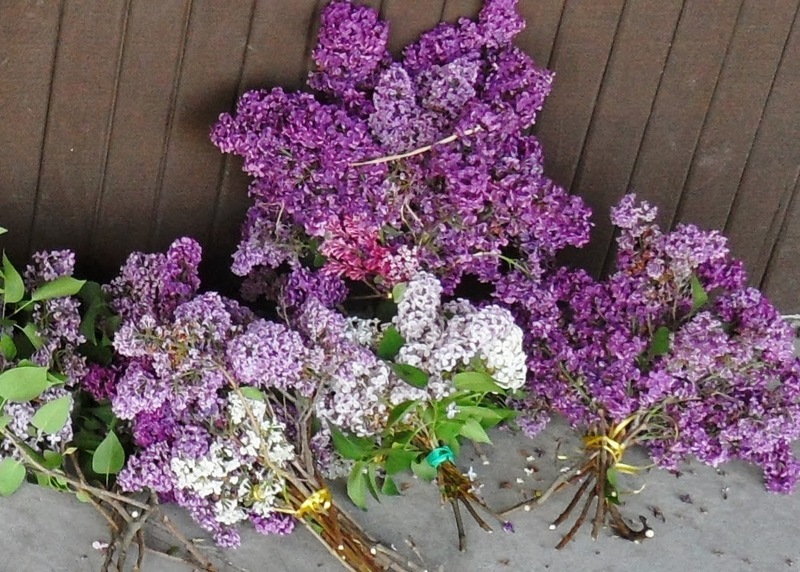 The week of her funeral, my beautiful friends organized a Facebook event they called "Lilacs for Ava Faith" to enlist people to bring fragrant blossoms from their yards to the church the day of the funeral "to surround Ava with the beauty that she has brought into this world." This was an incredibly touching surprise for us. These flowers will always look and smell like love to me. For Ava's one-year milestone, another precious friend gave us a purple lilac bush that we were able to plant in the country cemetery where she is buried. It is so special to have these plants present their purple gifts each year on Ava's birthday! Every single time I see purple now, I think of Ava and it makes me smile. Now that I think about it, I have become quite obsessed with purple. My toenails are purple, my new shower curtain is purple, I dressed my daughter Katelyn in purple today . . . and yesterday. Before I got my braces off, I requested purple bands so that my smile was purple. I am thinking about painting my kitchen. . . you guessed it. And, I am wearing purple as I type! Because he knows its significance to me, purple is also a way God gets my attention. One instance that immediately comes to mind happened on Monday, June 4, 2012, exactly one year from the day we met Ava. We had a big party in her memory on the Saturday before, but I hadn't really planned anything for the actual day. As I woke that morning, I realized that was a big mistake. I didn't want it to be a business-as-usual type day. I could feel the heaviness building as the before-preschool routine ensued. I made it to my son's preschool drop-off and as I walked out of the gate, there was another boy, his mom and 1-year-old baby sister walking in ready to celebrate his birthday circle. The little girl was so breathtakingly beautiful. I reached out and kissed the pudgy crease in her forearm, then turned the corner as quickly as I could before the floodgates burst open. It was one of those ugly cries complete with snot bubbles, and I was without a Kleenex. As I walked and cried, I prayed, "God, it is so unfair that Ava is not with me for her birthday today! It hurts so much, and I need your comfort." On the other side of the street there were beautiful lilacs in full bloom. I cried some more. As I crossed a street heading north, out of the corner of my eye I saw someone walking from the east perpendicular from my path. I ducked my head and hurried the rest of the way across the street. I picked up my pace and pretended not to hear. The last thing I wanted to do was have a mucousy conversation with a stranger. Ava's colour grabbed my attention, and I stopped and turned around. Across the street, the young woman said again, "Are you okay? I heard crying from down the street." I nodded yes; I nodded no; I nodded yes again. She crossed the street and my sobs started again. She walked up to me, gently put her hand on my shoulder and said, "Do you believe in God?" This startled me. I stopped crying and looked into her eyes for the first time. "Yes." My stranger with the purple outfit on said, "God sees that you are hurting, and he wants you to know he loves you very much." She asked if she could give me a hug. She asked if I wanted to share why I was crying. She asked for my name so she could pray for me the rest of the day as I came to mind. She also shook her head in marvel that she would be so bold as to yell out to a stranger who had already crossed the street, but she said she had felt uncharacteristically moved to do so. Experiences like this and all the lilac-laced love extended to our family over the past two years are amazing examples to me of the way God uses each of us to be his messengers of comfort. Before Ava, I did not fully grasp the impact that a single act of kindness can have. Thanks to this special girl of mine, I have come to see how God weaves these love offerings like vibrant colours into the darks and greys to make a beautiful tapestry of grace. My tapestry just so happens to be largely purple! These posts give me so much comfort...of course as I am crying along reading it. I certainly am familiar with the signs of loved ones passed as I just lost my mom a few months ago. I then found out I was pregnant again which was not in our plan but my mom seemed to wish it to happen. I found out this past Wednesday that I too am carrying an angel baby. One that will survive only a short while on its own after being born, if it is born alive. I can relate to the feeling of other peoples problems seeming so trivial. But also being with my mom as she passed away I know that there is a beauty and peace in death and that there are greater forces at work. I appreciate the work you are doing here. It is certainly helping me through my journey with my angel baby. Thank you for sharing here, Amanda. I am so very sorry that you no longer have your mom with you. As painful as it must have been at the time, it sounds like it was an amazing gift to have been with her as she passed away. I know you will miss her even more in the months ahead as you birth this precious child. And, my tears flow with yours as you go through all the emotions that come with carrying this special child of yours. I can only imagine. I am so incredibly blessed by your sharing what you have with me...that my words are bringing some comfort to you at this difficult time. You will come to know this feeling when you are able to see all the beautiful imprints that this baby you carry will leave behind. If I can offer any other thoughts for you at this time, it would be to not be afraid of loving this child with everything you have. There is no way to shelter yourself from the pain of loss, but there are many ways to shelter yourself from the joy of this life. I encourage you, if you are able, to make the most of the moments you do have with this baby. You may not have a lifetime of memories with this child, but your love and connection with this child can and will last your lifetime. Pictures, ultrasound videos, footprints, clothing, blankets, music, a special toy, the memorial...everything can become precious memories of this baby that I know you will cherish. I have a 100-page memory book of pictures and writings of Ava's "first year" with pregnancy pics, her ultrasound pics, pictures of the three days we held her at the hospital, pictures with her grandparents, pictures holding her in her pretty dress at the funeral home, photos from the funeral, pics of floral arrangements, her garden, her tree we planted in her memory, her name in the sand on a trip we took at six months, balloon releases, butterfly releases, memorial walks, her headstone placement, acts of kindness in her memory, special notes, poems, songs, little signs. . . etc. This is not at all the relationship we hoped or prayed for with these children of ours, but there is still a relationship there. You will always be a mother to this child, even though mothering this child is much different than your other children. I am extremely sorry that you may not be able to physically hold this child for long. In time, I pray you will find as much spiritual comfort and love as possible from holding this baby tightly in your heart. I found your blog through the Capture Your Grief hash tag on instagram. I just wanted to tell you that I appreciate you sharing your Ava and your grief. Being an open book is difficult sometimes, but your words and thoughts can help so many hurting people. Anyway, thank you again for sharing. You write beautifully. I appreciate your openness and your obvious love for your girl. P.S. I've had some snot bubble cries in public too. Ugh. Not fun!